Coaching people as a result from the passion for the sport. Getting the best results out of every one and trying to keep the athletes from doing "silly" things that keeps them on the side line. Coaching male and female athletes, mainly triathletes but also runners. As a little kid Sione started with gymnastics which was followed by playing soccer between the boys. In the following years she played also tennis and did a bit of swimming.Then she started studying and got involved into triathlon through a triathlon course.She seemed to have talent and got addicted to the sport.After a few seasons found out that the her strenght was in the long distance racing. She raced ITU long course for a couple of years before switching to Ironman.Unfortunately she got injured in 2008 and the the still unknown and unsolved running injury. 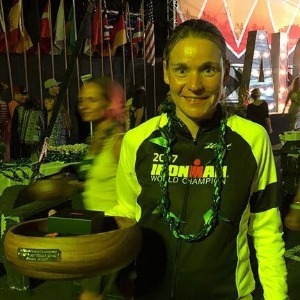 She decided to cycle in the elite women field.In 2013 she slowly and carefully tried to build up the running again which resulted in her 10th national title in 2014.In 2015 a break again, this time due to becoming a mom.Still not done with triathlon she started building up again in 2016 with as dream to start an Ironman again in her home country (Ironman Maastricht) in 2017 to become an “Ironmama”. The race went very well and she ended 4th overall and 1st Age Grouper.She took the slot and went back to Kona after 10 years.This time it was much more of a challenge, because of her 2 jobs and her two year old daughter.However she showed that one can do well with very good organization and discipline.She loves to stimulate and encourage athletes to get the most out of them and show them they are capable of much more than they believe themselves.Sione has been coaching athletes with a variety of capabilities and goals. Success. Coach Sione Jongstra has been notified of your message.